In the past, kitchen backsplashes were utilitarian, serving the sole purpose to protect the kitchen walls from splatters and spills. Today, backsplashes still serve that unique purpose, but now they do it with style! 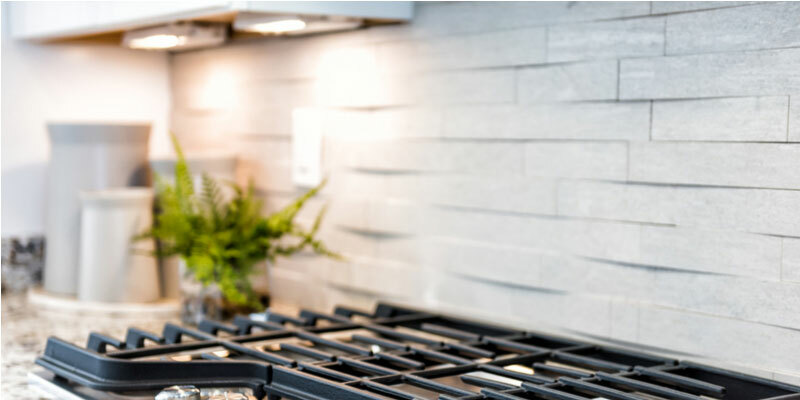 Distinctive design achieved with a vast array of striking materials has allowed the humble backsplash to become a focal point in kitchen design. The options for backsplash design are endless – classic tiles, on trend glass and mirror, shimmery metallics and rustic wood and stone – allowing homeowners to add their own unique style and transform their kitchens into functional works of art. When planning your backsplash, don’t be afraid to try something completely different! Here are some of the latest trends in backsplash design to consider. 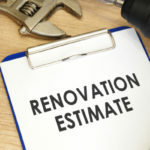 Reclaimed wood is among one of the trendiest options being used in today’s eco-friendly designs, but it may be something you never thought of for the kitchen backsplash. Hardwood isn’t only for your floors, in fact, it makes the perfect compliment to stainless steel appliances. Use wood antique reclaimed wood to create a unique mosaic backsplash that is sure to please. Always classic, tile promises to make a statement in your kitchen. Whether you chose complimentary or contrasting shades to bring out the best in your kitchen design, colorful tile can be a great choice. Subway tile offers lots of options for the traditional pattern which delivers a clean finish to the unique patterns like herringbone or stacked columns which promise eye-catching drama. 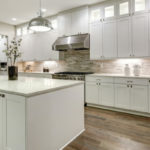 If you’re not sure classic subway is the right look for your kitchen, consider textured tile like limestone to add dimension or glass tile which reflects light all around. Still not sure which way to go with your tile? What about a combination of classic porcelain and glass tiles or a distinctive combination of limestone and glass tile? Remember, the possibilities are endless! Sometimes rustic and sometimes sleek, stone backsplashes are on trend. 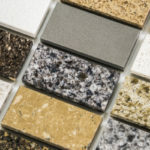 You’ve probably seen river rock used most often in bathrooms, but river rock is a beautiful out of the ordinary option for your kitchen backsplash. Quartzite is another great rustic option if you love stone. If you prefer sleek to rustic, consider the drama created by the natural color variations of translucent agate, a classic marble mosaic, or a unique marble harlequin checkerboard design for your backsplash’s signature style. Another excellent stone option is honed marble which promises a rich and warm feel for your kitchen. Love the look of stone, but don’t feel you can go all in? Try a mixed media blend of natural stone and glass tile for a look of distinction. The unique reflective finish of mirrors delivers a spacious feel to even the smallest space. A classic mirror backsplash makes the kitchen feel brighter and more open while an antique mirrored finish delivers more interest with unique reflective qualities. Metallics offer an inimitable finish to your kitchen. Tin sheets add visual interest making the room feel light and airy, all in a budget friendly way. 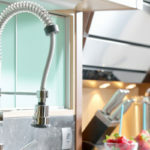 Stainless steel is a wonderful choice to compliment a colorful kitchen design. Finished bronze tiles or penny tile bring geometric design and an air of sophistication to the kitchen backsplash. Copper tiles (ceramic tiles covered with a thin layer of copper offers unique style and one that will naturally patina beautifully in time. You might find you want something a bit more exclusive, so here are some trending options. Since wallpaper is making a comeback in the kitchen, consider turning a favorite photo into your backsplash. Or how about a chalkboard backsplash, perfect for reminders or just doodling. Still not sure? Consider a coffee bean backsplash, a sea glass backsplash, or an embossed concrete design. Remember the choice is yours and your options are truly endless!